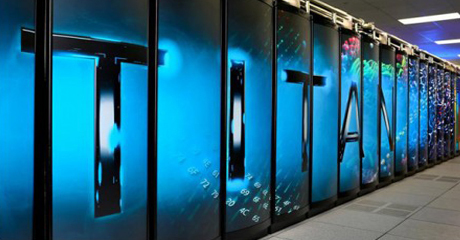 The new “TOP500” list of the world’s fastest supercomputers released November 12 named Titan, a new supercomputer at the U.S. Energy Department’s Oak Ridge National Laboratory in Oak Ridge, Tennessee, the most powerful in the world. Ten times more powerful than its predecessor, the Jaguar system, Titan will provide unprecedented computing power to accelerate scientific discoveries using technologies first developed for video game systems, the Energy Department said. Scientists will use Titan’s computing power for a wide range of research, including developing the next generation of materials used in manufacturing; for nuclear research to model the behavior of neutrons in nuclear power reactors; to model the combustion of fuels in internal combustion engines to improve engines for cars and trucks; and to simulate the atmosphere at new levels to help researchers better understand future air quality. Titan uses a combination of traditional central processing units (CPUs) and a family of processors called graphic processing units (GPUs) that were first created for computer gaming and have a unique capacity to perform the same operation simultaneously on multiple pieces of data, the Energy Department said. Sixty-one science and engineering projects involving U.S. and international investigators were recently selected for access to 1.84 billion core processing hours on Titan and 2.83 billion hours on other Energy Department supercomputers.